Ahi tuna, asparagus, baked potato w/pico de gallo. I’m so ready to go to Group Step tonight after work! Yesterday I did a few yoga stretches in the morning but other than that it was a rest day, so I’m definitely feeling energized and anxious to get my cardio on, especially after sitting at my desk job/in class today and yesterday. I’m having takeout black beans and quesadillas from my favorite local Mexican place, Loco Perro, after my workout. Then my Nana Connie and I are off to the Bushnell to see The Addams Family Musical! 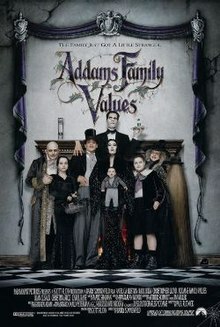 One of my family’s favorite movies to watch over and over again is Addams Family Values, so I am anxious to see this musical. I love talking to other people and finding out what their “family’s movies” are. I feel like everyone’s family has those one or two movies that they quote endlessly and never get sick of. It’s hilarious how one family’s treasure can be another person’s “WTF?” (like when I was told by my friend Kim that her family’s movie is Meet the Parents – big confusion on my end). Thanks to Nana Connie for the pic! Do you have a movie that you can watch over and over again with your family and quote endlessly? Does it bring about any special memories? What are your plans for tonight?